Combine flightseeing, a glacier, and a mushing camp, and what do you get? An unbelievable Alaskan adventure! We began our journey in the historic Klondike Goldrush town of Skagway, located in Alaska’s Inside Passage. Our destination? Eastward, to the Denver Glacier and the summer home of a phenomenal group of young men and women from Alaska Icefield Expeditions. Whisked away on an 8-mile, 15-minute helicopter ride, we saw jaw-dropping mountain scenery, from snow-capped peaks to deep crevices to glacial ice flows. Flightseeing to the Denver Glacier, nothing but majestic snow-capped mountains as far as the eye can see. As we neared the camp, it seemed to pop up out of nowhere. The color scheme is white – from the mushers’ huts to the dogs’ platforms – to blend in with the surroundings. The summer home of about 16 mushers and handlers and over 200 sled dogs. After our helicopter dropped us at the camp, it left to return to Skagway to pick up the next group of adventure seekers. 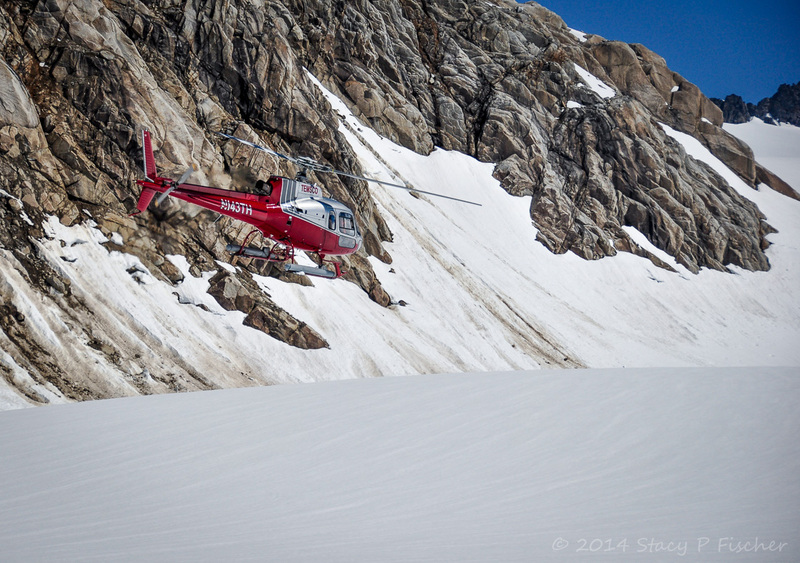 A Temsco helicopter lifts off from the glacier after leaving us to enjoy our dog sled experience. And then we met our musher: Matthew Hall. Tanned from the summer sun, sporting sunglasses and a short-sleeved t-shirt, his goal is to participate in the Iditarod, the 1049-mile race from Anchorage to Nome. He introduced us to our ten-dog team, while the handler harnessed the dogs to the sled. We had the option to sit in the sled or stand on the runners. My husband and I took turns at each position, marveling at the strength and agility of the dogs as Matthew kept them on the 2-mile track around the perimeter of the glacier. We took a few stops along the way, to rest the dogs and for photo opportunities. Fun fact: “Mush” is rarely used as a command. Gee (with a hard “g”) for right turn; haw, for left; hike or all right, for go; and of course, woah. I leave it up to you to figure out what that one means. A team of ten sled dogs, taking a much-deserved break mid-way through the run. After our run, we met some very special inhabitants of the camp: puppies! Some were a few months old; this one was so young she hadn’t yet opened her eyes. An hour after landing on the glacier, our helicopter returned and we had to say goodbye. It was difficult to leave this magical place, but I was left with a sense of pride: in the mushers, in their wonderful dogs, and for our 49th state. 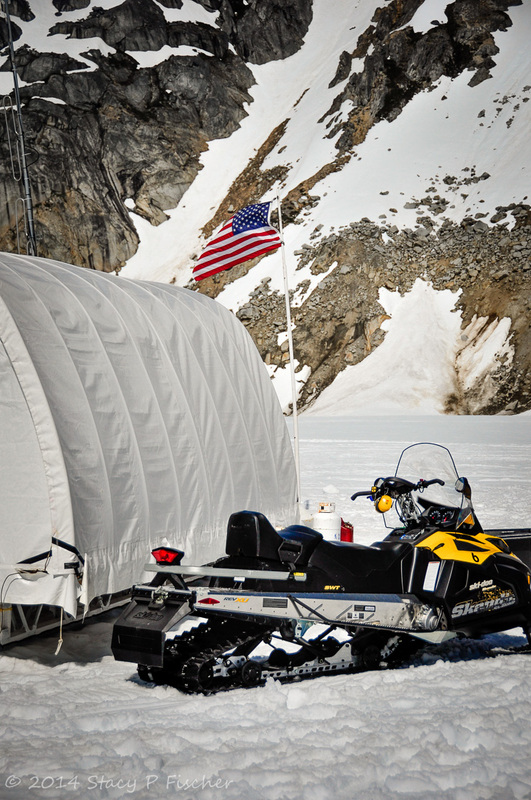 Even in this remote glacial camp, an American flag is proudly displayed. This entry was posted in Alaska, Landscapes, Places and tagged aerial view, dogs, dogsledding, glaciers, helicopters, landscapes, mountains, photography, Skagway. Bookmark the permalink. It was absolutely amazing, Karen! Something I will never forget. We got to “play” with the big dogs too, but the puppies were way too hard to hand back! Amazing!!! Loved the entire post, but the dogs and the puppy…Just amazing! Thanks, Shelley! They are gorgeous dogs. It was amazing to watch them work as they pulled us around the glacier. Luckily, half-way round the trek, the mushers gave the dogs a break, as much for the dogs, I think, as for the photographic opportunity. We had a chance to really interact with them as well. 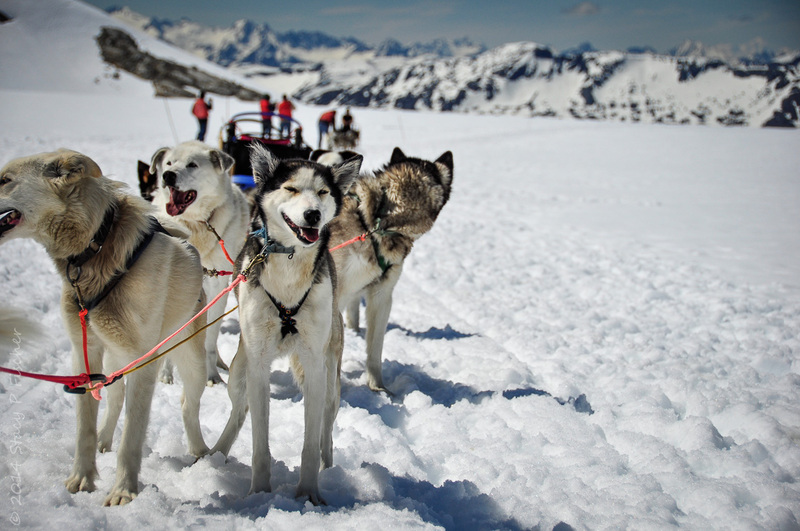 All in all, dogsledding is a spectacular experience! Outstanding photos! And the puppy is sooo sweet. What fun. I think you should use the little sled dog to be on Threshold too. Must have been a great adventure. Wow! Spectacular photos and story. Thanks so much! Glad you enjoyed it. It truly was a once-in-a-lifetime experience. I feel so blessed to have had the opportunity.